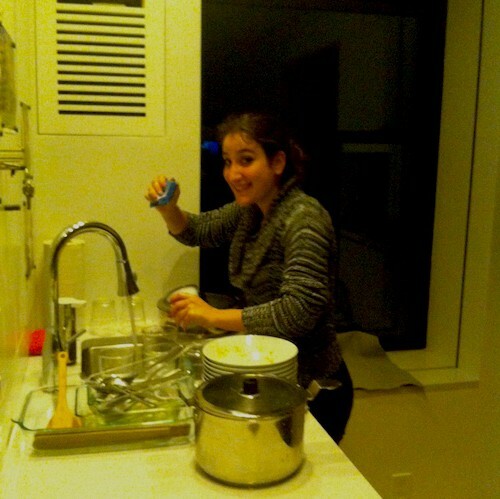 A TaskRabbit doing dishes in the surprisingly spacious Life Edited kitchen. The seasonal menu consisted of homemade pickled Chinese squash and seaweed crackers, kabocha Japanese soy and sake-braised squash, butternut squash and pear latkes served with sautéed greens, and pumpkin whoopie pies with cream filling for dessert. Guests represented the full spectrum of New York’s creative side: developers and designers, architects and entrepreneurs. The group began the night as strangers, but in this incredibly designed and intimate setting, they said goodnight as if they were long-time friends. Guest blogger Noah Karesh is the co-founder of Feastly. Follow him on Twitter @eatfeastly. and the incredible chef’s name?!!! !